The price you found is 21% lower than this hotel's average rate of $512/night. We are absolutely thrilled to receive such wonderful comments, thank you. We spent two nights of our two week Provencal vacation at this lovely hotel. It is in a very small town on top of a hill in a beautiful region of Provence. The views from the hotel are stunning! There are a lot of positives about this hotel. The staff is very friendly and professional. We had a problem with our room the first night that was handled quickly and professionally. The rooms contain all the technology you could ever want with flat screen TVs, DVD players, iPod docs, etc., and there are a lot of movies you can "rent" for a night. The hotel is decorated tastefully, has beautiful grounds, and has a heated pool with great views. Every part of the little town looks like a postcard from Provence, and you really feel like you are stepping into history as you walk along the narrow stone pathways. The only negative about the hotel -- and the reason I did not give it 5 stars -- is the restaurant. It is very poor by local standards. We ate outstanding, memorable meals all over Provence, and our meal at the hotel restaurant stands out for being our worst dinner of our entire trip. Unfortunately, it was also among our most expensive -- you do not get what you pay for here! The food was presented well, but it was very, very bland and overcooked. It cannot compare to the tasty food we had at the restaurant in the town on our other night at Crillon Le Brave. I would recommend avoiding this restaurant and eating elsewhere in Provence, including the wonderful little restaurant in the town, just down some steps from the hotel (same views as hotel restaurant, but with better food and better prices). That being said, I wouldn't hesitate to return to this hotel on a future visit to Provence. We are delighted that this reviewer enjoyed the hotel and grounds and found the staff friendly and professional which is something that we pride ourselves on. Disappointed however, that the restaurant food was not to their liking. We are always working on improving our restaurant food and service so constructive suggestions both good and bad are always welcome. We just completed third visit at Crillon le Brave and enjoyed it thoroughly. The food is very good. The staff are all excellent and very accommodating. The setting is very nice. When the weather is good, the meals on the terrace are memorable. 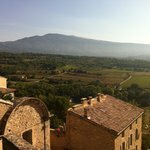 It is not inexpensive but we have many excellent memories of our stays at Crillon le Brave. Room tip: Talk to the reservations staff and explain what you want. We are delighted that these guests enjoyed every element of Hotel Crillon le Brave and have done so on several occasions. We would like to thank them very much for their comments and for the very helpful ‘room tip’. We look forward to welcoming them back again. Stayed in the Master Suite which has lovely views from inside, but an odd set-up of the toilet off the main living space. Indeed it's a combined bathroom and day space, with the bedroom above. The terrace has no view once you're seated and is pretty small. It also overlooks the petanque area, which was used by a very load group on our first evening. WiFi was intermittent in the room. The restaurant is poor by local standards. During the five days we were there we ate there on four occasions (on the basis that having been out and about all day, I wanted to stay put for dinner), twice on the terrace, once in the bar area and once in the indoor - dungeon-like restaurant (due to the weather). No meal was memorable food-wise, unlike at lunch-time where we had wonderful meals out from the 'no star' La Fournil in Bonnieux to the €400+ Oustau de Baumaniere at Les Baux to the hard to find Le Saule Pleureur on the road from Monteux to Avignon and the Restaurant le pre du Moulin at Serignan du Comtat. The wine list and the waiting staff are the restaurant's saving grace, with the exception of the sommelier who is surly and doesn't like being questioned why he brings bottles to the table opened. The pool area is small and given that the hotel has a policy of children being welcome 'anywhere, anytime' it can become noisy. To end on a final positive note, the guys who organise the cars and sort out the baggage are absolutely excellent. It was very disappointing to read that these guests did not enjoy their stay with us. The Duplex Suite is one of two of our Master Suites and is adored by many; however it is impossible to suite everyone's tastes. It is really important that we find the right room for each guest as they do vary. Our reservations team are always happy to take time to describe specific rooms and views. I am saddened that meals were not memorable on this occasion and our Sommelier was surly as normally the friendliness of the staff and the making of guests feel special is what sets us apart from many other hotels. Great to read that our porters are excellent! We are a family friendly hotel and we do welcome children anywhere but do have a 'quiet time' policy around the pool in the afternoon. We were grateful that this reviewer brought these matters to our attention and we have passed on their feedback to the relevant staff. I had heard about this hotel several years ago and had been waiting for an opportunity to go there. We finally went last week, but were sadly disappointed. First the plus points: the hotel is in a beautiful location, in an ancient village at the top of a hill, overlooking the Provence countryside. There are lots of interesting buildings that make up the hotel and most of the staff spoke good English, although we tried to speak French whenever we could. The rooms are nicely decorated in a very "designer" style and provide lovely l'Occitane toiletries. The pool area was very nice and we did enjoy relaxing here during our stay, they also send round a member of staff to take drinks orders from around the pool. However, we were very disappointed with the food. I had lamb on the first night and this was quite tasteless and very tough, even though it was supposed to be roast leg of lamb, I could barely chew it and my knife could barely cut it. Another night I had pigeon, I know pigeon is a small bird, but this one was all bones and only a couple of mouthfuls of meat. In general the food was not very flavoursome and there is a limited choice, the menu does not change except for one daily special, so after 3 nights we had eaten everything we wanted to eat from the menu. We tried to go to the other restaurant in the village, Le Petit Four, but this was "unexpectedly" closed one night, and fully booked the next. The restaurant service was also not good, on two evenings they got our order wrong and also forgot to bring things, then disappeared so we couldn't even ask them to bring the missing items. This was all very disappointing considering the main courses were about 30 Euros each. It was lovely to eat our dinner on the terrace, but of course it was getting quite dark at about 8:30 - 9:00pm and the only lighting was a small candle on each table. On two of the nights we could not even make out what food was on our plate, it was so dark - I think they need to have some better overhead lighting out there! We also found the wine extremely expensive, and settled for the 50cl bottles most nights, which ranged from 25 to 35 Euros. In fact, although the hotel's prices are high, they are in keeping with other hotels in the Relais & Chateaux group, but because of the poor quality of the food and the service, our overall feeling was that the place is a bit of a rip-off. We had a bad start to our stay, as we had booked a junior suite and paid a deposit for one night in advance, of 400 Euros. When we arrived, the receptionist told us we couldn't have that room because the air conditioning unit was broken and that we would be given a cheaper, superior room, normal price 300 Euros. We weren't happy about this and asked to see the cheaper room, which they showed us. It was a nice room, but we had paid for a better room so we asked to see the Junior Suite, just so we could see what we were missing. They said we could not see it because workmen were in there and that it would be fixed the next day. At this point we smelt a rat and said we didn't mind going in there with workmen in there. There was much whispering behind the scenes and then the director, Christian Deteil, came out and said that we could not see the junior suite as there were guests in there who had stayed for 6 nights and wanted to stay an extra night. We asked why these guests could not be moved to the cheaper room so we could have the junior suite but M. Deteil said he could not do this. We said we weren't happy with how this had been handled and he then said he would give us the first night's accommodation free of charge. To be fair, they stuck to this agreement and I think this was the least they could do given that they had changed their story. If only they had just done this right from the start instead of saying there was an a/c problem. Unfortunately this experience tarnished our stay and although we did move to the junior suite for nights 2 and 3, we felt like second class citizens who weren't important enough to be treated well when we arrived. The Junior Suite was very nice, with a lovely sitting room downstairs, although upstairs was quite cramped. We have stayed in a number of Relais and Chateaux hotels, including Le Manoir in Oxford, L'Oustau de Baumaniere and Villa Gallici in Aix-en-Provence, and have always found them to be exemplary in all aspects of accommodation, service and food. I think the Hotel Crillon le Brave lets down the reputation of Relais and Chateaux and should not be allowed to be a member of the group. I will never stay there again and am so sorry my dreams were dashed. "Disappointing" is the right word. We should have done much better for this guest, and we usually do as most of the other tripadvisor reports indicate. The ridiculous mess-up about the reserved bedroom (at the beginning of her stay) was frankly inexcusable and undoubtedly created a cloud over her whole visit. We made some very stupid mistakes. Our whole team is aware that our guests are to be treated in a fair, honest and respectful manner at all times. This guest has our unreserved apologies. There are also some lessons here about our restaurant and although we have garnered some good restaurant reviews over the past summer, we will take these suggestions and criticisms on board and see what we can do better in the future. We are doing a lot right but there is always room for improvement. Christian Delteil the GM greeted us .We had a great lunch on the balcony overlooking Provence ! All of our team enjoyed their food . The wine list is long and contains some very good wine.Next time we are in Provence we will stay here for sure!!! !